Hearing loss can impact your quality of life in many ways. It can disrupt conversations, limit productivity, and jeopardize your physical, mental, and social well-being. But hearing loss is also highly treatable, and help is available to those who want to take back control of their hearing health. Hearing loss affects an estimated 20 percent of the US population, or 48 million people, and the communication problems it creates affect many more. In addition, hearing loss has been linked to a host of conditions, including cognitive decline, depression, and social isolation. But the latest research also shows that improving your hearing can prevent these problems, keeping your brain healthy and young. With the right professional help, you can achieve all of the benefits that come with better hearing, including enhanced overall health and a greater appreciation for all of life’s best sounds. At Advanced Hearing Solutions, our team of audiologists have a combined 60-plus years of experience helping people hear better. What sets us apart is our personalized approach to patient care, where we’ll take the time to get to know you so that we can properly assess your needs. We’ll then guide you through the process of understanding your hearing loss and finding the right hearing aid technology to match your lifestyle and budget. From start to finish, we’ll be there to guide you on your journey to a lifetime of better hearing. Are you ready to get started? "Dr. Motel is professional and incredibly knowledgeable. I felt like she was a true partner and advocate throughout the process. She is trained to fit many different types of hearing aids-allowing her to find the best one for me. My experience was very positive and I highly recommend Advanced Hearing Solutions." "The audiologists really helped me a lot with the hearing aids. I’m so happy to be able to hear EVERYTHING now!" "Dr. Reavell knows her profession well and is able to communicate effectively with patients. She explained in understandable terms about hearing loss as well as different types of hearing aids. She took her time with us. Dr. Reavell displayed professionalism, encouragement and concern." When you hear clearly, you can easily follow what people are saying and be part of the conversation. 2. You’ll keep your mind sharp. Enhancing your hearing has been shown to prevent mental decline and can keep your brain healthy and young. 3. You’ll improve your relationships with family and friends. Why strain your family’s, friends’ and coworkers’ patience by always asking them to repeat what they just said? When you hear better, it’s easier to communicate and stay connected. 4. You can increase your income. 5. You’ll feel better physically. Hearing clearly is a key part of staying healthy and active. Hear better and stay young! 6. You’ll enjoy life more. Access to a comprehensive hearing evaluation. As Doctors of Audiology, we are trained to diagnose, manage and treat hearing disorders. Personalized care. We learn about you and your hearing environment, which helps us determine the best technology solution for you. Your choice of the best technology. We invest the time to train with multiple manufacturers so you get the best result. Our loyalty is to YOU, not to our vendors. Precise hearing aid fittings. We fine-tune your hearing aid to ensure you achieve the best result possible. Counseling and aural rehabilitation. We’ll train you on the daily use of your hearing aids to optimize results. 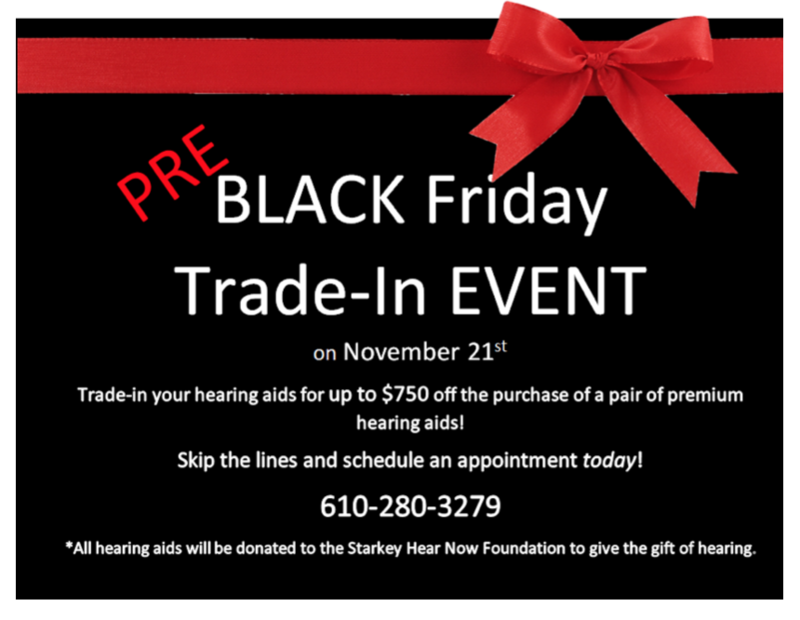 30-day trial period for all hearing aid purchases. 60-day exchange period for a different size or style. Comprehensive warranty plans for all hearing aids. Call us today at 610-981-1692 or send in this form now.